Kerala is well known as a tropical paradise. Being close to the equator, the Kerala climate is a perfect blend of warm sunshine and dark storm clouds. After the tiring heat of the summer comes the monsoons, to drench the dry earth and quench its thirst. The cool monsoon is a welcome reprieve to both the land and its people. During the monsoon months, the water resources of the state, all forty-four rivers and associated lakes and dams, fill to the brim making the land ready for the next summer with enough groundwater on hold to last through the relentless heat. The monsoon is not an incessant pouring of rain either. The rainy days are interrupted by sunny, warm hours which adds to the beauty of the whole affair. The summer and the monsoon months keep such a perfect balance that the land remains beautiful throughout the year. The monsoon season in Kerala falls under two categories. The south-west monsoon of June, which is called “Edavappathi” by the natives as it arrives in the middle of Edavam month of the Malayalam calendar. The second one is the North-eastern monsoon which arrives in October, also called “Thulavarsham” crediting to the Malayalam month. Both the monsoons together constitute the copious amounts of rainfall the land receives, making it lush and green. The monsoon months enhance the beauty of Kerala hill stations as it gives birth to new springs and streams rushing through the rocks, creating something so mesmerizing to the eyes. These small springs and streams, with its fresh, cool, monsoon water adorn the green nature with its diamond sparkles and rainbow sunshine. All the waterfalls will transform into something awe-inspiring owing to the ample amounts of water that the monsoon bestows. The dams will be filled to their maximum capacity, leading to the opening of the shutters which is a sight to behold. The roaring of water will take away all the noises of everyday life and replace with a tranquil like quality, giving you peace of mind. Monsoon is the best season for Kerala’s authentic Ayurveda treatments and therapies as it is considered as the season where the body’s immunity drop. The Ayurveda treatments during monsoon are aimed towards the holistic rejuvenation of both body and soul. Varsha Ritucharya, as it is called in Ayurveda intents to maintain the balance of the body despite the sudden change in climate, boosting its immunity and maintaining good health. According to Ayurveda, Monsoon is the best season for rejuvenation therapies. During the Monsoon season, the atmosphere remains dust-free and cool, opening the pores of the body to the maximum, making it most receptive to herbal oils and therapy. Another important aspect of Kerala life during the monsoons is the changes that the artists of native art forms make in their habits pertaining to the fact that full-body control is required at any given moment to create their art. These art forms demand the complete devotion of the artists in the form of dedication and uncompromised training. A part of this training process is the Ayurvedic therapies that they undergo in order to sustain excellent health. The herbal oils and the medications that the artists apply on their body during monsoon are beneficial to muscle flexibility and dexterity of movement. It’s rejuvenation time for the people as nature celebrates the rain. Many famous resorts and hotels in Kerala facilitate Ayurvedic Wellness Centers where guests could have the bona fide Ayurvedic experience, filling their body, mind, and soul. There are so many Ayurveda massage parlors out there, especially around the famous tourist destinations, operated by small-scale entrepreneurs all over Kerala. Most of these centers will not have qualified doctors or therapists. This is something of a great concern as wrong medication and treatment can ultimately harm your body and mind. So, while choosing these, one should always get guidance from a Kerala Tourism Accredited Tour Operator, so that they don’t end up falling prey to the capricious minds. During the monsoon season tourists flow from various foreign countries, preeminently the Arabs, flock to the many hill stations of the state to indulge in the cool and green beauty of the rainy nature. Places like Munnar, Thekkady, Vagamon, and Wayanad relish in the monsoon season due to the tourist flux. Some Tourists even go for houseboat cruise during monsoon season. The backwaters of Kerala during monsoon transform themselves into a celebrated beauty, in the lap of which the guests could enjoy the rains. It aids the guests to have an uninhibited view of the falling rain, which soothes the mind. Away from the noises of the crowd, just you and nature’s song to keep you company, it’s the best time to enjoy a cup of hot tea and a book, cocooned in the warmth of a blanket. Or to just merely sit and watch the fascinating beauty outside. Some Tourists do just that, and relax in the Backwater Resorts of Kerala, enjoying the white noise of rain and quiet peace. The beaches of Kerala may be tumultuous and unpredictable during monsoon season. The waves rise higher than they usually do, and the sea herself will be turbulent and fierce. So, It is better to opt for Hill stations and backwaters during monsoon season for maximum enjoyment. Come and enjoy the monsoon in God’s own country and refresh and revitalize your body and mind. 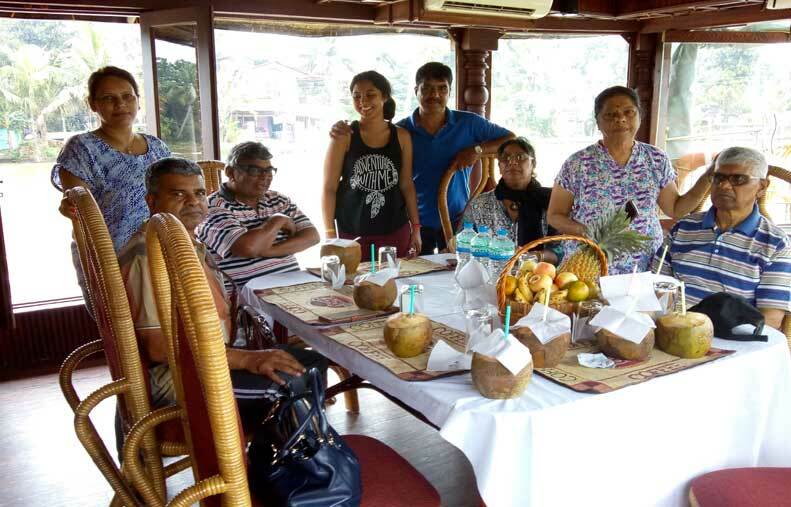 A day long cruise of the Punnamada Lake Backwaters at Alleppey/Alappuzha by Ms. Kritika Juhi and her lovely family of eight from Mauritius. 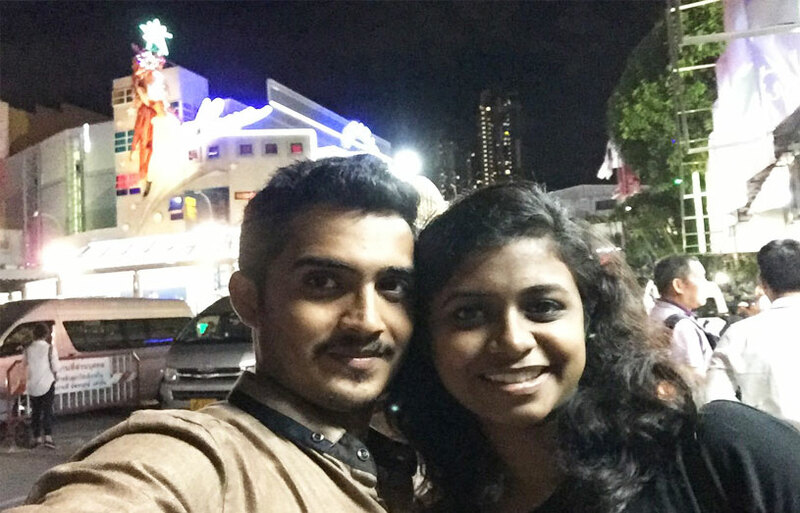 The International experience of the newly wedded couple, Mrs. & Mr. Shijin P Mathew. The visit to Bangkok & Pattaya in the amazing country of Thailand.